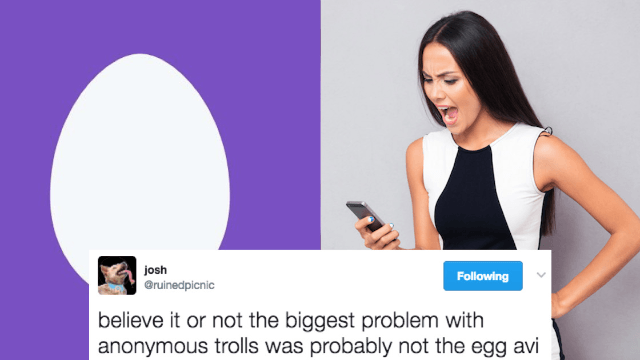 Twitter got rid of the egg avatar and people are not happy about it. However, this change doesn't address the abusive behavior of the human behind the profile. And of course Twitter users pointed that out. Really, Twitter? The egg is not the problem any more than a hoodie is the problem. Person: Hey Twitter! I'm being harassed by the man in the red shirt. Twitter: Hey man. Change your shirt. Other Twitter users just straight up missed their egg avatars. THE TWITTER ICON???? IS NOT????????????? AN EGG ANYMORE????????????????????????????????????? So now people can get harrassed by gray decapitated humanoids instead of eggs. Wonderful! PROBLEM SOLVED!